A crash at the intersection of Ridge Avenue and Lake Street in January. The city added left-turn arrows to traffic signals at the intersection on Wednesday to reduce the number of accidents. The city added left-turn arrows to traffic signals at the Ridge Avenue and Lake Street intersection in central Evanston on Wednesday in an effort to address recurring vehicle collisions, engineering and capital planning bureau chief Lara Biggs said. 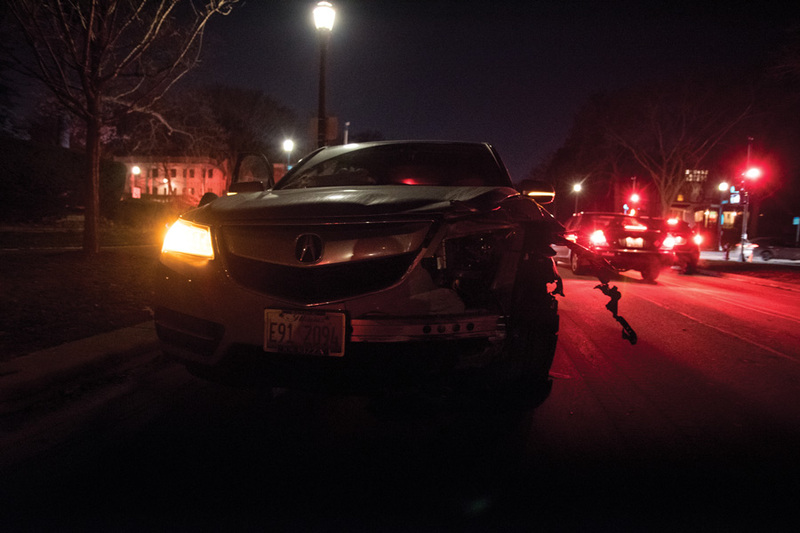 After the number of collisions spiked in the Ridge Avenue corridor last year, Biggs proposed several changes to aldermen in February to reduce the number of accidents. The left-turn signals, which cost about $10,000, are the city’s latest measure to make the intersection safer, Biggs said. She said the addition of left-turn arrows is temporary, and the city will evaluate their effect on traffic flow and accident reduction sometime next year. The left-turn signals will address accidents caused by cars turning left, Biggs said. Without a left-turn lane, Biggs said, there is currently a lack of visibility for cars turning. In February, aldermen approved reducing the speed limit on Ridge to 25 mph to reduce the number of crashes. Biggs said the Evanston Police Department additionally began targeted enforcement of speed and distracted driving regulations. Evanston police communications coordinator Perry Polinski said there were 269 citations issued between Feb. 12 — when the new speed limit was implemented — and March 9. In January, 21-year-old Luke Spalding said his car was hit by a vehicle turning left at the Ridge and Lake intersection while he was traveling north on Ridge. He said Ridge is a “cramped” road, especially when going 30 mph with traffic. The Evanston resident added that he used to drive through the Ridge and Lake intersection 10 times a week when he was in high school. Biggs said if the city decides to keep the signals, there will be a proposal to conduct a long-term study and coordinate the timing of all the traffic signals on Ridge. She said it would be expensive to make that change, though it would improve traffic flow.